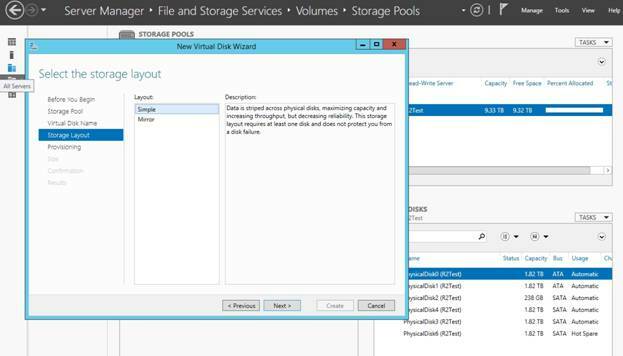 In my previous article in this series, I walked you through the process of creating a storage pool in Windows Server 2012 R2. I also showed you how you could create a virtual hard disk on top of the storage pool that you created. That article was based on the preview release of Windows Server 2012 R2. Now that the RTM release is out there are a few minor changes and at least one bug that I want to make you aware of. If you look at Figure A, you can see the Server Manager console on one of my lab servers. As you can see in the figure, I have created a storage pool that is made up of a combination of standard and solid-state drives. As of the time that the figure was created, there were no virtual disks built on top of the storage pool. Figure A: This storage pool is made up of standard and solid state storage. 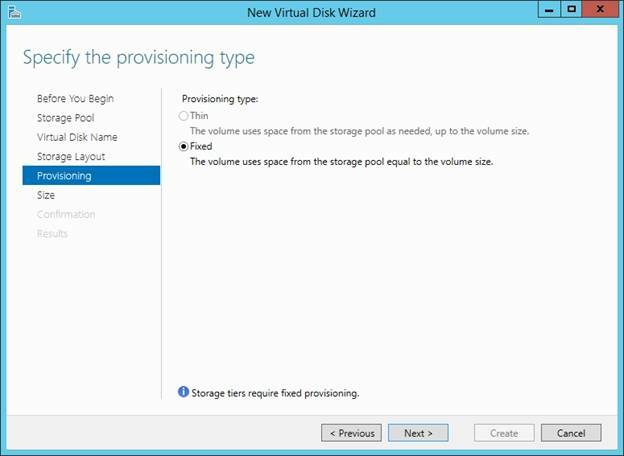 As was the case in the Preview release, you can still use the New Virtual Disk Wizard to create a virtual disk on top of a storage pool. However, you might find that some of the options that were previously available within the wizard have disappeared. It isn’t that these options are actually gone, but rather that the options that are displayed within the wizard vary depending upon the choices that you make early on. One of the areas in which Microsoft has made some changes is with regard to the storage layout. As you might recall from the previous article, there are three basic storage layouts that you can choose from. These include Simple, Mirror, and Parity. However, if you take a look at Figure B, you will notice that the Parity option is missing. Figure B: That Parity option is gone. So what happened? At first it is probably easy to assume that the reason why there is no parity option available is because the storage pool either does not contain a sufficient number of physical disks to allow the parity structure to be created, or the required disks exist within the storage pool but have already been claimed by other virtual disks. In this particular case, neither of these conditions holds true. 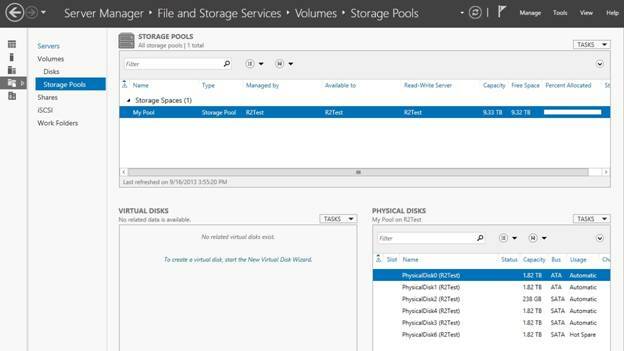 I captured the figure shown above in a way that shows the disks that are included within the selected storage pool. As you can see, there are plenty of physical disks available for creating a parity set. Unfortunately, there wasn’t really a good way for me to show you in the screen capture how the disks are currently being used, but I can tell you that the disks aren’t being used at all. In fact, this is the first virtual hard disk that is being created on the storage pool. For whatever reason, the Parity option disappears if you choose to enable the storage tier feature. It is possible that the disappearance of the Parity option could be tied to a limitation within my own server hardware. If you look back at the figure above, you will notice that only one solid-state drive is included in the storage pool. It could be that Windows takes away the option to create a parity set when I select the storage tier option because there are not enough solid-state drives to be able to create a solid-state parity set to accommodate the fast storage tier. At this point in time I have not been able to find any documentation to explain the absence of the Parity option when storage tiers are enabled. I think that the absence of the Parity option is related to not having enough solid-state disks to build a parity set on the fast here. Let me show you why. 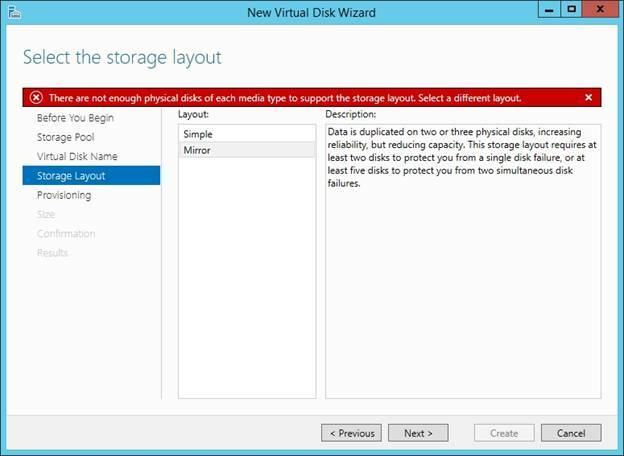 As previously mentioned, the selected storage pool only includes one solid-state disk, and yet the New Virtual Disk Wizard provides an option to create a mirror set. At first it might seem that the fast storage tier must not get mirrored because otherwise the option to select a mirror set would not be available. However, if you select the Mirror option you will actually receive an error message telling you that there are not enough physical disks of each media type to support the storage layout, and that you must select a different layout. You can see what this error message looks like in Figure C. The fact that Microsoft chooses to provide an error message if you try to create a Mirror set, but does not even provide the option to select a Parity set is a good indication that this is a bug. Figure C: Windows displays an error message if I try to create a mirror set. Another thing that you need to be aware of is the fact that if you choose to create storage tiers, you lose the ability to perform thin provisioning. If you look at Figure D, you will notice that the Thin provisioning option is grayed out. This only happens when you choose to create storage tiers. Figure D: You can not use thin provisioning and storage tiers together. At the beginning of this article, I mentioned that there was a bug to watch out for. The bug has to do with creating a volume on top of a virtual hard disk on which storage tiers are being used. 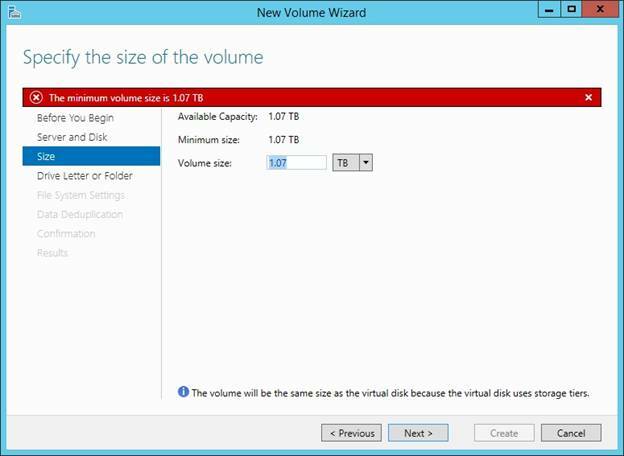 When you create a new virtual hard disk, Windows automatically launches the New Volume Wizard upon successful creation of the virtual hard disk. As you saw in the previous article, this wizard asks you to specify the size of the volume that you want to create. It also asks you to select a drive letter and a file system. The bug has to do with specifying the size of the volume. As you can see in Figure E, Windows displays an error message indicating the minimum volume size. However, the wizard will not allow you to create a volume of that size (or of any size for that matter). Figure E: A bug in the New Volume Wizard gets in the way of volume creation. While experimenting with this bug I discovered that the volume size must match the virtual hard disk size exactly. The only way that I was able to make the wizard create a volume was to calculate out a significant number of decimal places to specify as a part of the volume size. I can’t remember exactly how many decimal positions it took, but I can tell you that it was a lot. In this article, I walked you through a number of changes as well as a couple of bugs related to virtual hard disks that have been built on top of storage pools. In all likelihood, Microsoft will provide some better documentation and hopefully some bug fixes in the relatively near future.